Offensive systems in volleyball vary from team to team. There are different systems in volleyball. Do you train your athletes according to your system? Or do you create a system for what's needed? You have likely heard of the term "in system". The coach wants the team to be "in system" as much as possible. What exactly does it mean to be, "in system"? In order to be successful, your volleyball team needs to execute a system of attack. The more you can define your offensive system, the easier it is to focus on executing your offense. You've likely heard a coach use terms such as "in-system" and "out-of-system". "In System" basically means that the ball is passed where the setter wants it. Where the ball is passed is very important to the outcome of the play. For example, it's usually much more difficult to hit a ball that is coming from off the net. You have probably noticed that a ball that comes from 15 to 20 feet off the net is harder to attack than a ball that comes from within 3 or 4 feet of the net. Have you ever tried to hit a ball at the net, that was set from the endline? It's very difficult to hit this ball. For one thing, it's very difficult to use your peripheral vision and see the ball. Peripheral vision is the part of vision that occurs outside the very center of gaze. We need the ability to see objects and movement outside of the direct line of vision. Basically, it's tough to see the blockers, defenders, the net, and the court when hitting a ball that's set from further off the net. An out-of-system ball isn't just a ball that's being set from far off the net. A pass that's tough to set could also be considered out-of-system. Coaches will often define an out-of-system ball as a ball that's passed in a way that's tough for the setter to make a good set. If the setter doesn't make a good set, then it's considered "out-of-system". So basically, if the pass is way off the net, then the set won't be as good because the ball coming from off the net is harder to hit. Even passing closer to the net could be considered out-of-system if the setter can't quite get there in position to make a good set. Is it better to be in-system or out-of-system? Obviously, your attackers are more likely to get a kill if you're in-system, so it's better to be in-system. Maybe this is a better question. What should your team work on in practice? Is it better to work on practicing in-system all the time or should you spend some time working on the situation of being out-of-system? You won't be "in system" all the time during a real game. And if your team doesn't pass good, then you'll be out-of-system a lot. So would there be an advantage to being pretty good at being out-of-system? If you're a team that has a lot of trouble being in-system (maybe your team doesn't pass very well), it's probably a good idea to work on being out-of-system. For example, design a drill where the set comes from way off the net. Have your attackers get good at attacking this ball. You see all the time coaches warming up hitters by tossing the ball to the net and the setter setting from there. 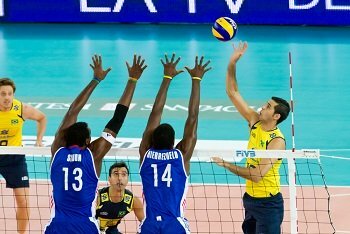 Would it be a good idea to have your setters set from off the net in practice? How do you Define your Systems in Volleyball? Every team has their own unique style of play. Your coach should define the role of each player on the team. Does your team have big hitters or are you guys mainly short and quick? You have to understand your team identity in order define your offensive system. You've probably noticed some teams win because they are really good at being in-system all the time. You've also probably noticed some teams win when they are out-of-system most of the time. Why does a team win even though they are out-of-system all the time? They win because they got "good" at attacking the out-of-system set. This usually happens when a team has a big dominating outside hitter. This has become a common strategy in volleyball today. Set the ball high and outside to a big hitter. Again, have an identity. You don't want to make the mistake of trying to play like somebody you're not. For example, if your outside attackers are really good at attacking the high outside set, then they may not need to get good at going fast. On the other hand, if your outside attackers are smaller and faster, then "going fast" is probably really good strategy because if you're smaller, it's probably harder to get kills hitting the high ball. If you're out-of-system, it's very difficult to run a fast offense. For example, if you are a team that relies on running quick sets to the middle or shoots to the outside, then you need to be in-system a lot because it's hard to hit quick if the pass is bad. The bottom line: If outsides are big hitters and are pretty good at getting kills off of out-of-system balls, then master the out-of-system ball. Don't make being "in system" so important if it doesn't need to be. On the other hand, if your outsides are really bad at getting kills off of out-of-system balls (especially if they are small fast athletes), then make the in-system attack the priority.